Imagine ships all set for battle. The guns are blazing. 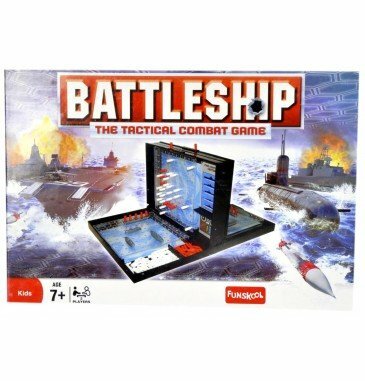 The one who sinks the opponent’s ships by calling out hits and misses wins this exciting naval combat game. You are the commander of your fleet, so prepare your strategy and lead your troops to victory. Call out your coordinates and mark your hits and misses. Try to destroy your opponent's fleet first. Classic naval warfare game. Look for your opponent's fleet by calling out squares on the grid. Requires strategy and logic. Game sets are portable, making them easy to play at home or on the road. For 2 players.